The girls and I started off our year on the right foot with 12 miles for 2012 on the rail trail. The run started off a bit cold at 28F. However, the sun was shining and there was zero wind. Since it rained all day yesterday, the trail was super slick for at least the first half. 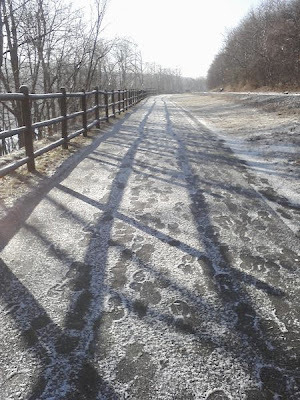 On our return run, after our 6 mile snack/water stop, we noticed the ice starting to melt in some place and the sun was warming up. Today was one of those days I wished my Garmin could tell me the temperature. It surely had warmed up significantly. We were guessing at least to 38F. Believe me. In Maine, on January 1st, sun + 38F = real treat. I'll take it as long as I can get it! We also completed 2 of our virtual races today. Not our best 5k time on the trail for our long runs, but definitely not our worst. It was the ice that got us. Did you get your run in today? Congratulations on your virtual runs! I ran them too! My husband and I ran a 7.5 mile race and I used the first 5K for Kiley's New Years Virtual run and the second 5K for Amanda's Resolution Run. I am shocked that it is 38 degrees in Maine right now! My mom said that it was warm today too! Great job getting out today!!! Actually later in the day, the thermometer read 41F. I couldn't believe it. We guessed well on the temp on the way back. My car said 37! And now, at 11:15 PM it is 45! Craziness! Oh, and my watch said 2:02:45 for our 12 miles. Even better! Thanks for the pics! We got similar temps, but crazy hard wind that was NOT fun to run in. But I got in 4.2 mi (and totally forgot about double points day - yay). Way to rack up the points! I got my 5k in on New Years Day at the Lowell First Run, it was a blast (though slightly hungover), followed by post-race fro-yo... yes, frozen yogurt on New Year's Day. It was 38* after all.